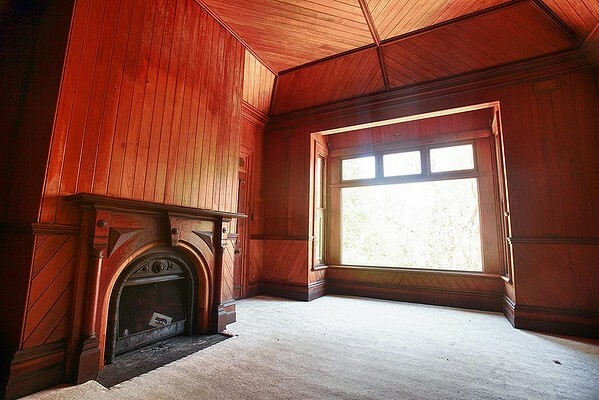 In 1898 the house was listed for sale and was purchased by Melbourne wool buyer Toussaint Dewez. The Dewez family had three gardeners and added many North American trees to the magnificent 6 acre grounds. Dr. Robert Harbison and his wife Thelma purchased the house in 1972 and made some alterations including extending the service wing. 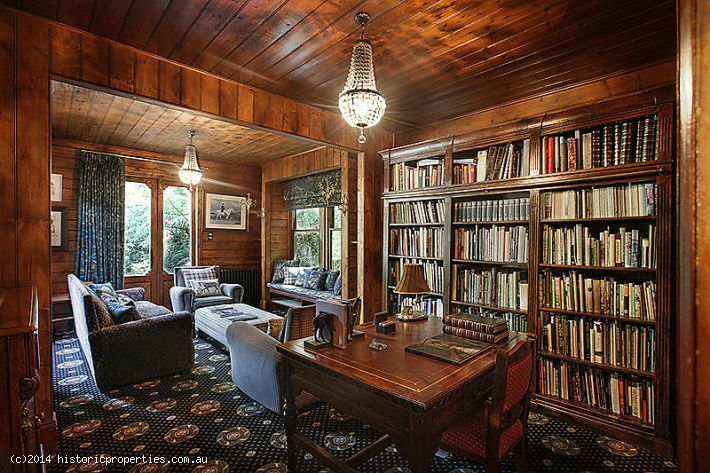 ‘Karori’ the stunning Mt Macedon home restored to its former glory by owners Dominic & Marie Romeo. Photo/Production – Danielle White/The Countryphiles. 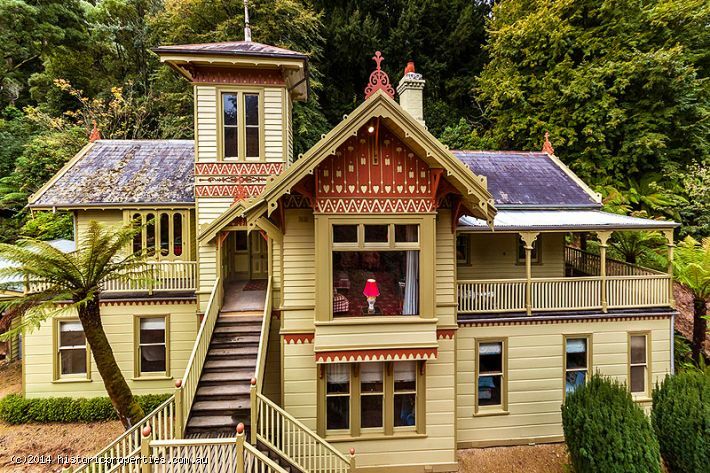 ‘Karori‘ the stunning 6-acre hill station property on Mt Macedon restored to its former glory and preserved by owners Dominic & Marie Romeo. Photo/Production – Danielle White/The Countryphiles. Photo/Production – Danielle White/The Countryphiles. ‘Karori’. An enchanting wonderland leads to a beautiful stately home. Photo/Production – Danielle White/The Countryphiles. A hidden gem given a new lease of life by Dominic & Marie Romeo – ‘Karori‘. Photo/Production – Danielle White/The Countryphiles. Dominic & Marie Romeo at the entrance to their MAGNIFICENT home and most recent restoration and preservation project ‘Karori’ in Mt Macedon. Photo/Production – Danielle White/The Countryphiles. 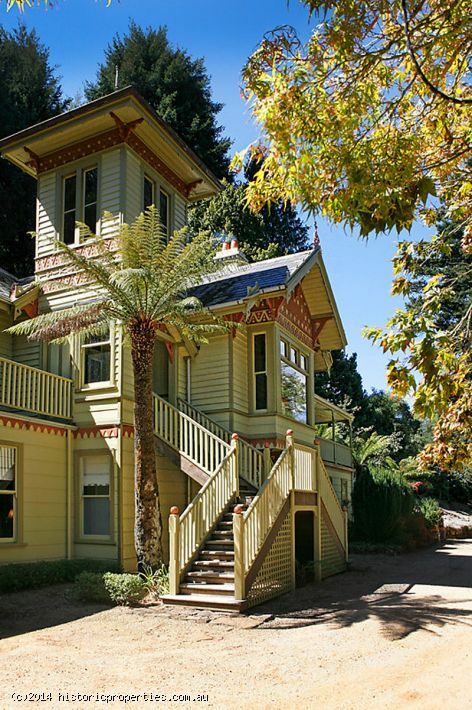 The hillside town of Mount Macedon has one of the best collections of 19th century grand homes and exotic gardens in Australia. Overgrown gardens surround the house. 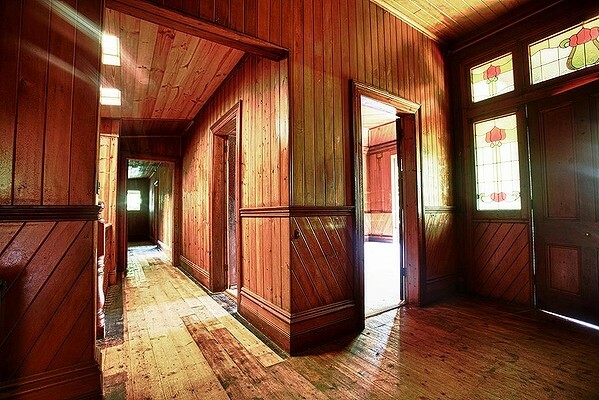 This restoration enthusiast is smitten by the potential in a shabby 1890s chalet. 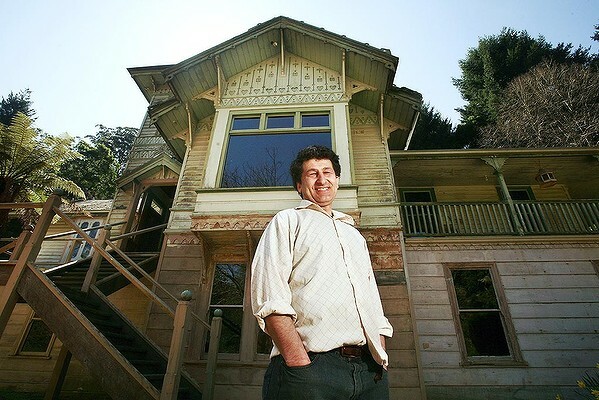 It’s lucky Dominic Romeo likes the cold, is passionate about the tasks of major heritage renovations and has a wife, Marie, who is an interior designer, because they’ve just taken on the task of fixing up ”Karori”, a heritage-listed 1890 hill station at Mount Macedon. 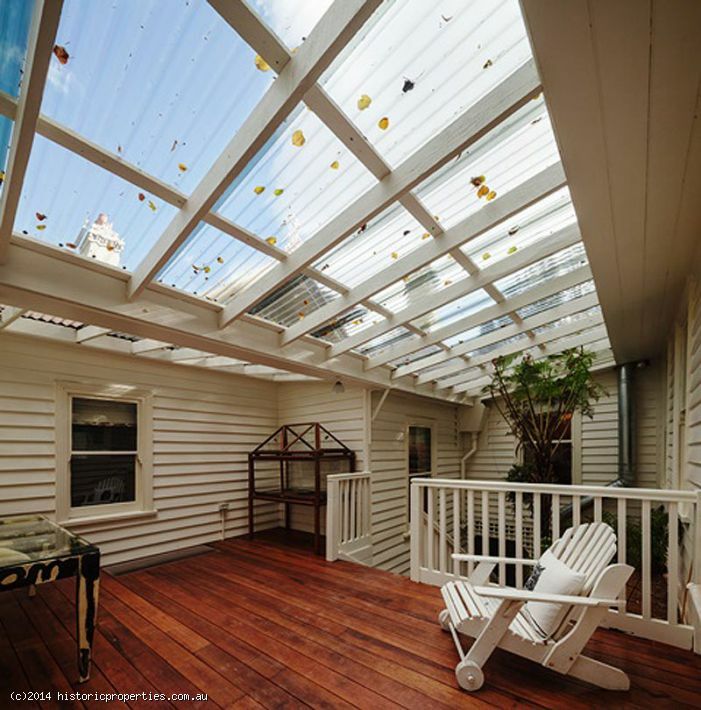 When he saw the six-bedroom weatherboard pile in the overgrown 2.47-hectare garden full of huge, 120-year-old specimen trees, he says it took him a two-second visual survey to know ”this was it”. The Swiss-Italian-style chalet with its decorative fretwork, fancy roof finials, tall chimneys and square tower was the very definition of shabby chic, albeit with impressive provenance. The glorious tree-lined road that winds its way up to Dominic & Marie’s beautiful home ‘Karori‘ on Mt Macedon. 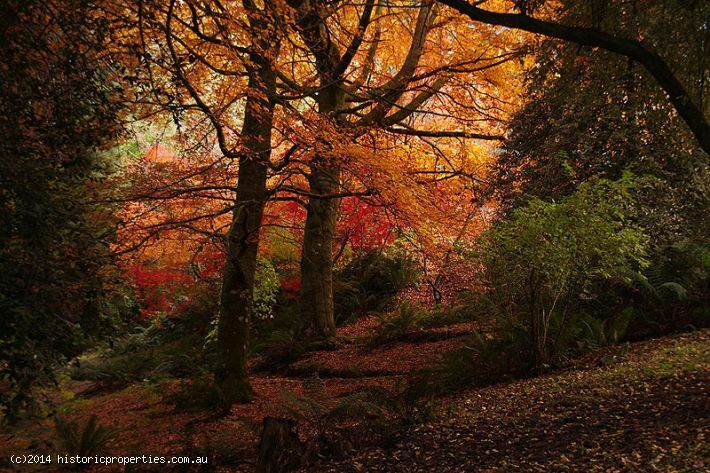 The autumn colour is nothing short of BREATHTAKING! Photo/Production – Danielle White/The Countryphiles. WOW! Where do I start. Everyone I meet on The Countryphiles is AMAZING in their own and various ways (which is precisely why we feature them!). However, when The Countryphiles recently met husband and wife team Dominic and Marie Romeo ‘WHOOSH’ – up went the AMAZING stakes! Marie is an established interior decorator and owner of ‘Bellholme‘ – a gorgeous home interiors and giftware store in Kyneton’s Piper Street while Dominic runs ‘Stalking Cat‘ in neighbouring Woodend – an amazing store that specialises in quality country house wares and antiques. But wait – there’s MORE! Dominic has received 20 awards in tourism and business, is a Fine Art Photographer (you can see his wonderful documentary photographyhere), is a Board member of the National Trust of Australia (Victoria), sits on a number of National Trust committees in finance and conservation and is on the Yalari fund raising committee to provide educational opportunities for Indigenous children! I suggest you take a breath ’cause there’s still MORE. Dominic was also a competitive member of the Australian Acrobatic Ski Team and Coach for Team Buller! When not doing all those impressive things, the couple have spent their married life combining their skills, talents and passions to restore country heritage houses – in particular HUGE period country estates. And they don’t just restore the exteriors and interiors of the these MASSIVE homesteads, Dominic and Marie also restore and reinstate the grounds, which often include botanically and horticulturally SIGNIFICANT gardens, extensive lawns, flower beds, vegetable gardens, fruit tree groves and outbuildings. Oh, and they have two sons; Joel and Greg. PHEW! Don’t know about you, but I’m exhausted! AND what’s more … I’m very IMPRESSED and very PLEASED to know that Dominic and Marie devote their lives to preserving and honouring our precious country heritage! Photo – supplied. Production – Danielle White/The Countryphiles. ‘Burnewang‘ restored by Dominic & Marie in the 1990s. The grand 34-room Jacobean/Elizabethan country homestead was built in 1903 and is situated on the banks of the Campaspe River east of Elmore. Photo – supplied. Production – Danielle White/The Countryphiles. 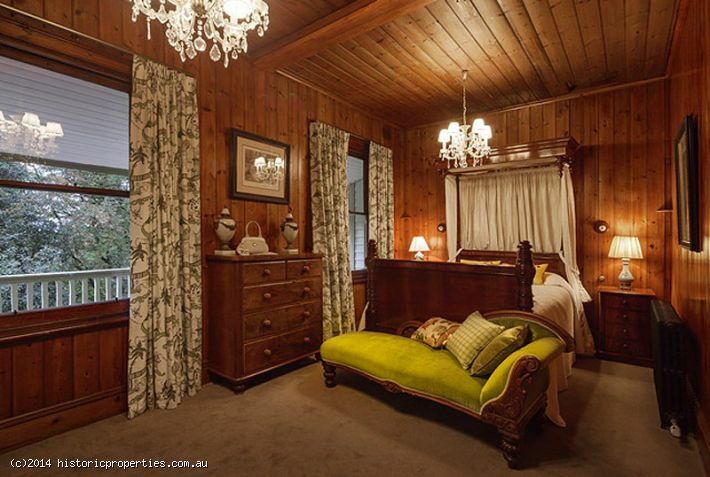 ‘Rupertswood’ restored by Dominc & Marie Romeo. Photo – supplied. Production – Danielle White/The Countryphiles. 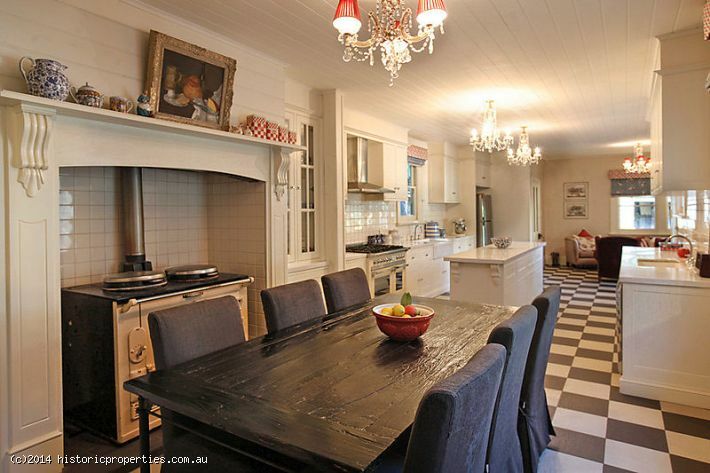 ‘Rupertswood‘ restored by Dominc & Marie Romeo. The painstaking restoration included extensive gilding, wood graining, marbling and uncovering decorative wall frescos. After completing the restoration, Dominic and Marie ran Rupertswood as a leading conference, accommodation and function house so that the community could enjoy the fruits of their labour. Photo – supplied. Production – Danielle White/The Countryphiles. 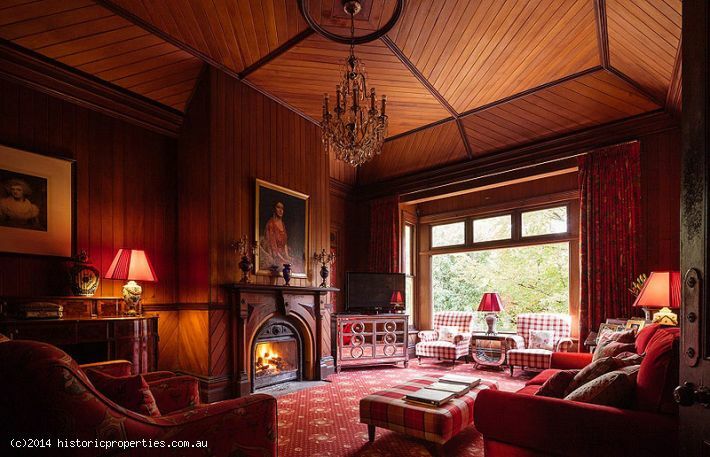 ‘Benue Lodge’ Mt Macedon. Restored by Dominic & Marie Romeo. Photo – supplied. Production – Danielle White/The Countryphiles. 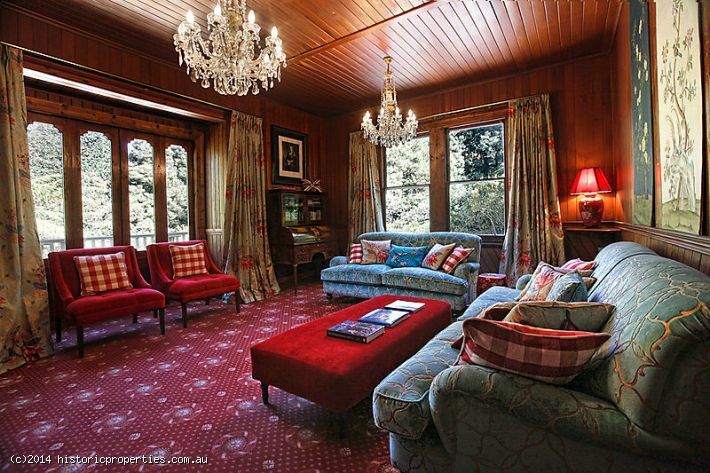 ‘Benue Lodge‘ is a classic hill station on Mt Macedon. Restored by Dominic & Marie Romeo over a two-year period. The five-bedroom home also includes a potting shed, pergola and swimming pool. The 3-acre Victorian garden was revived and still contains original plantings including a Sawtooth Oak, Indian Bean Tree, Cedars, Douglas Firs and Weeping Elms.The restoration included the pathways winding through it, the walled rose garden, the orchard and the original tennis court. Photo – supplied. Production – Danielle White/The Countryphiles. 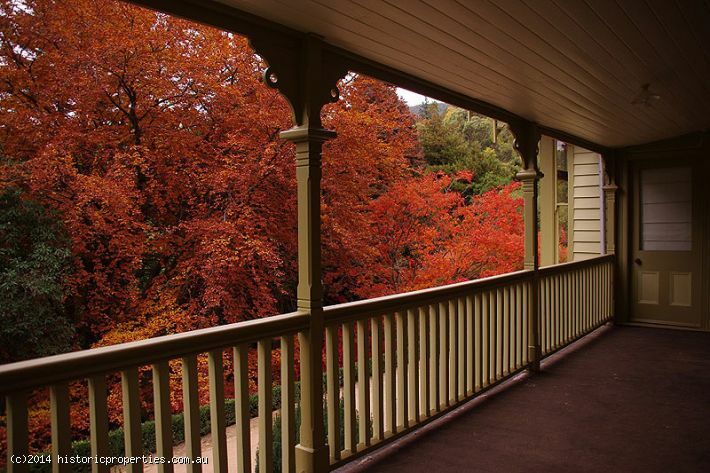 ‘Timsbury’ another fine example of a hill station property at Mt Macedon. Restored by Dominic & Marie Romeo. Photo – supplied. Production – Danielle White/The Countryphiles. 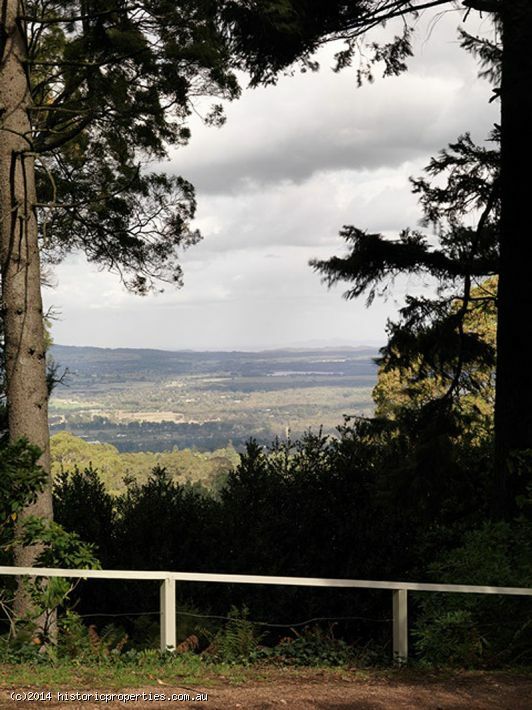 ‘Timsbury‘ another fine example of a hill station at Mt Macedon. Built in 1875, restoration included a maid’s quarters, a box room, an old scullery, a servant’s entrance vestibule, and grand formal rooms . Photo – supplied. Production – Danielle White/The Countryphiles. 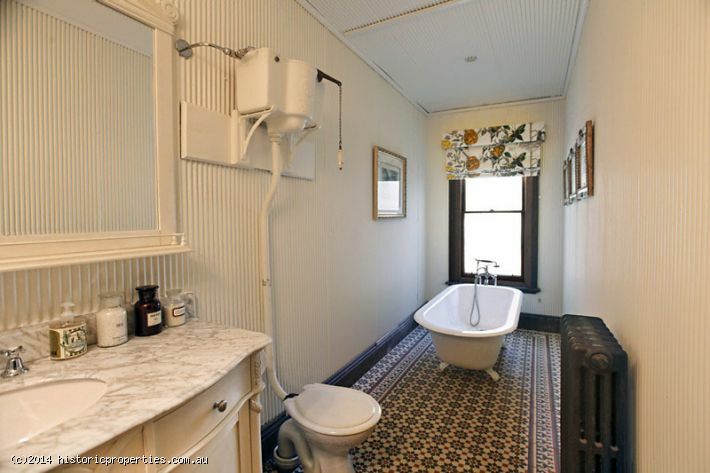 For many of us, the idea of renovating a bathroom is daunting enough, let alone restoring a 50-room Italianate mansion! Not so for this couple! So how did it all begin? Put simply – they worked very hard and they worked very well together. 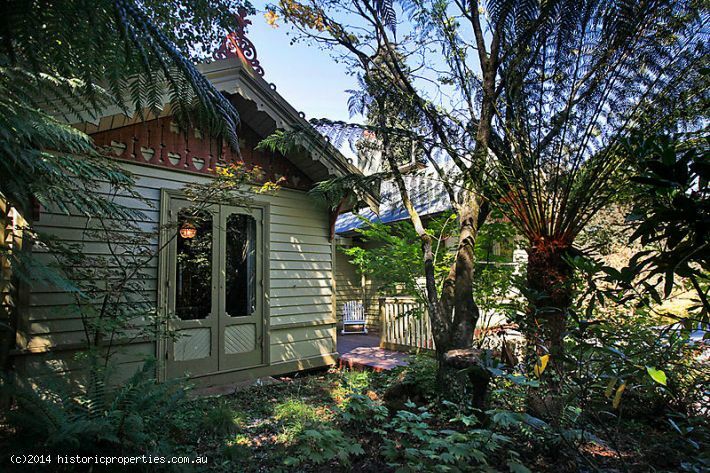 As young newly weds, Dominic and Marie’s first house was a Victorian cottage in Moonee Ponds. Before long they found themselves falling in love with, saving up, buying and restoring ‘Calder House’ in Maldon; a decision that unexpectedly launched them into a lifetime’s work and passion restoring heritage homes. From the very beginning, the dynamic duo shared a DREAM to ‘one day’ own a large country estate homestead. Along the way, they came to realise they also shared what it took: a strong work ethic, great planning and research skills, self-belief, talent, passion and a ‘can-do’ attitude. Decades later, their dream has come true – a few times over. 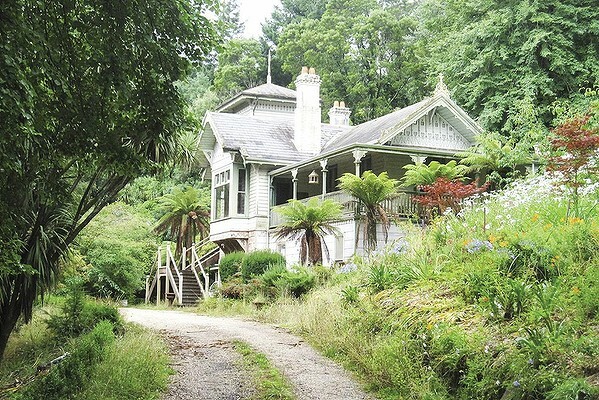 Dominic and Marie have restored 10 such homesteads including Burnewang (34-room Jacobean-Elizabethan homestead), Rupertswood (50-room Italianate mansion), Timsbury (including 5-acres of garden), Benue Lodge (five bedrooms each with an ensuite) and most recently Karori in Mt Macedon. ‘Karori‘ pictured during the process of restoration. Dominic and Marie’s project work is thorough, coordinated and devoted in equal measure. A great deal of time and energy is put into paying painstaking attention to detail, which requires sourcing colours, wallpaper, fabric, carpet designs, furniture and fittings sympathetic to the architectural period of each property. Photo – supplied. Production – Danielle White/The Countryphiles. The finished project. ‘Russia’ – Dominic and Marie’s beautiful Husky – is very much at home in the crisp mountain air that often envelops ‘Karori’. 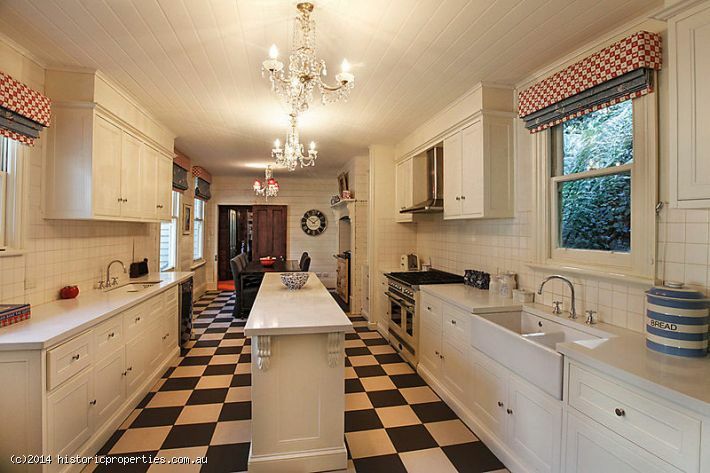 Dominic and Marie have just put Karori on the market – so you can get a sneak peek inside here! Photo/Production – Danielle White/The Countryphiles. Karori – an outstanding Historic Mt Macedon Hill Station property perhaps one of the finest located on 6 acres of spectacular garden and grounds of epic proportions. The property has been beautifully restored maintaining the integrity of a past era combined with today’s modern comforts. The grand residence is approximately 50sqs of living over 2 levels and includes 6 bedrooms, 4 bathrooms and separate shower room, formal and informal living areas, study, library, TV room and modern kitchen all serviced by hydronic heating, solid fuel heating and open fire places. 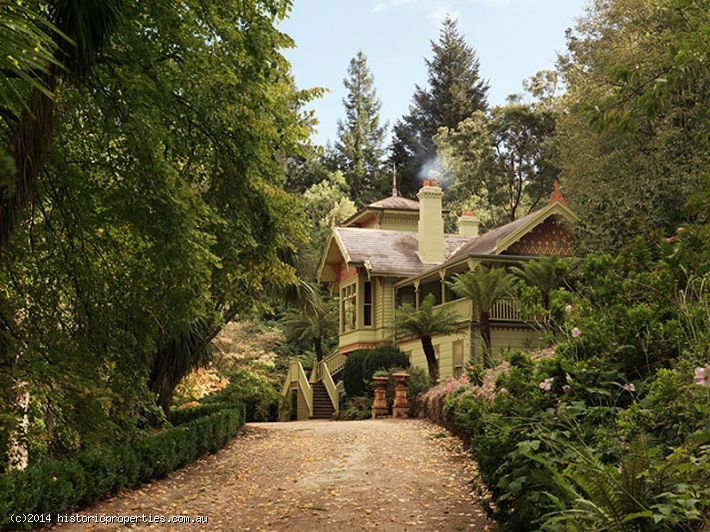 Karori’s garden is regarded as one of the major gardens on Mount Macedon with terraced stone walls, meandering paths and many rare and exotic trees including Weeping Elm, Monkey Puzzle, Cryptomeria, Silver Birch, Larch, Spruce, Cooper Beech to name just a few. 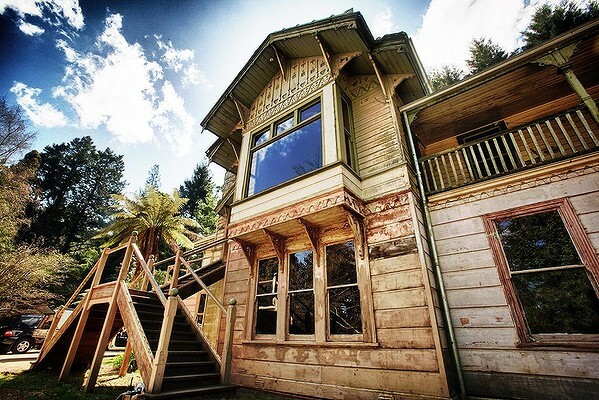 Karori is a living reminder of the past, a gem of natural beauty that has been over 100 years in the making. This is a indeed a very rare opportunity. The exterior will likely get a coat of soft green.